Our latest Patriot Act and FISA call and online chat went very well as we further discussed how to set up our foundation for the long haul, and what we need to strategically do to become increasingly effective. Mark discussed the resurgence of Organizing for America during the healthcare fight, and he has continued to keep us updated as far as they go. He was very impressed with their recent work, and generally has received the impression that there is a recognition about the mistakes made in regards to the social network. We’ll continue monitoring this as closely as we can, and would love ideas (and especially help) to ensure our OFA presence (or whatever social network they move to) thrives! Mark also got a hold of staffers for both Judiciary committees and was told to expect nothing legislatively until the next couple of months, if ever, before the election. Bob brought up the pending retirement of one of the FISA fight’s earliest champions, Sen. Chris Dodd, and questioned whether his concluding senatorial career and desire for a lasting legacy could be leveraged into an even greater level of championship in his dwindling time in office. Mark is researching Dodd’s FISA speeches from the senate floor, and generally this could be something we pay increasing attention to as we strive for new proponents with backbones and guts on this issue! We discussed the Tea Party movement and the recent slew of racist tirades and series of threats and acts of violence that have followed the conclusion of the health care debate. Jim also provoked discussion of this within the OFA mail listserv, and it is something for us to take very seriously given our continuing efforts to reach across the aisle to likeminded libertarians. The key for us is to find those who we can work with in good faith whose primary concerns relate to civil liberties and the constitution, but we must not be naive to the existence of the radical elements that have become increasingly empowered and enflamed who do not share our democratic values of liberty for all. The connection of equality to civil liberties could especially come to ahead given the diversified coalition the BORDC is working to establish through their local initiatives. We need to ensure we are welcoming to any and every ethnicity and demographic group in general, which is why I personally am so excited to see the next steps from the BORDC! Lastly, post-meeting, Bob wrote a few comments asking questions about the future of Get FISA Right and citing the Facebook meeting stats of attendees vs maybe attendees as a rationale for dissolving our organization in the name of pragmatism. To this point, although we all should recognize the degree of disillusionment that has flourished in the wake of Obama’s capitulation both before the election on FISA and this past winter on the Patriot Act, I disagree wholeheartedly with the suggestion that we look for other organizations to take us in and that there are any irredeemable signs of organizational weakness. This is because, more than anything, we are a community, one that began on the MyBO list serv but has since been spread across the spectrum both in terms of our communications structures as well as the diversity of our differing ideologies. We are a community that has been meeting consistently and continually progressing, all while staying on the cutting edge of new media activism to do anything we can to push this issue into mainstream political discourse—-as we did before! Our numbers have ebbed and flowed in terms of participants and effort extended to the cause, mostly reflected by the legislative calendar, and although I completely understand Bob’s frustration, I think we should remember why Get FISA Right is a different organization from the other ones doing fantastic work, take stock in what we have achieved, and strategize for the fights ahead accordingly. Thanks to Bob and Mark for joining the meeting, to Salli for posting our mission and vision statements, and Jim for instigating post-meeting conversation on the list serv, and to the entirety of our community for your attention, perseverance, and support in this effort! At our March 10th conference call, the participants voted that the Mission and Vision statements were ready for prime time. Thus, everyone reading this is cordially requested to spread the word loud and far, town criers all. We are a proud group of informally affiliated individuals who supported President Obama during his candidacy in large part because of his call for hope and a new kind of politics. Our vision is one of a United States that is both free and secure. We see a United States in which the ordinary citizen is afraid neither of the government, despite its ability to monitor internal affairs responsibly, nor of his or her neighbors—an America in which every citizen understands that in all just wars, people are required to sacrifice some things, but they are never required to sacrifice their natural rights, protected—not given—by the Constitution of the United States of America. Our view is of a United States in which citizen and government vigilance does not involve destroying basic Constitutional protections. Our ultimate mission is to restore the fundamental Constitutional basis to United States national security laws, so that the inherent liberties of citizens are protected from government intrusion—for example, unregulated surveillance, improper invasion of personal privacy, and unacceptable limits to freedom of expression—as intended by the Bill of Rights without compromising duly authorized actions of federal agencies. 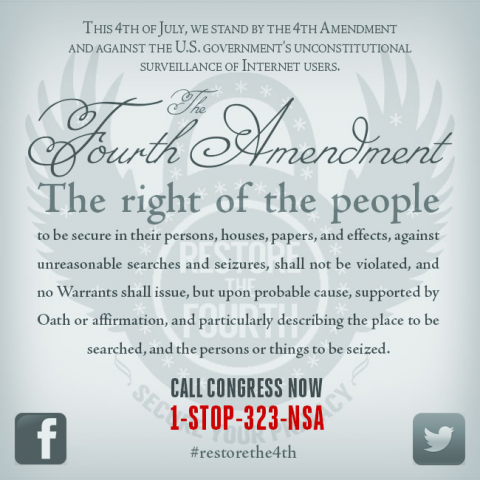 We’re holding our next Patriot Act and FISA organizing call this Wednesday at 4:00 PM PST / 7 PM EST. Here is the meeting page, and please feel free to take full advantage of our online chat pre-meeting! This week we will be focusing on grassroots activism amidst our efforts to re-establish our mission and communication mechanisms, all in order to increasingly reflect what we have learned about utilizing new media to impact tangible, on the ground change. We have decided to hold bi-weekly meetings instead of weekly to maintain and sustain energy over the long haul. If something bigger comes up though, we’ll switch up based on events. A variety of team members are taking more of a lead through our communications channels as “faces of Get FISA Right”. Special thanks to Sally for taking initiative and offering to make the polls for our calls as well as getting more involved on our blog (her first post on our Mission and Vision statements is upcoming) and OFA mailing list, to Mark for offering to take more of a lead on OFA (and the blog potentially as well), and to Jim for helping more with Facebook. We still need more volunteers to step up though (particularly with Twitter), so please let us know if you have any interest! Jim has taken the lead offering advice on how we could leverage Patriot’s Day as an event to support our issues. He has offered to attend the festivities in Boston (where it is primarily located), and Harry and Ben are going to meet to discuss feasibility of something in Wisconsin (as well as WI civil liberties activism in general). We need grassroots supporters to step up though here as well, so let us know if you are in the Boston or Wisconsin areas especially (where Patriot’s day holds the most salience) and/or are generally interested in taking part! We continued our longstanding discussion about how to incorporate libertarians sensibilities and Tea Party activists working in good faith into our coalition. In particular for Patriot’s Day, we found that Second amendment activists could be a sweet spot for collaboration. Thanks to Sally, Brandon, Mary, Ben, Korkie, Mark, Jim, Jon (in the online chat) for taking part, and to everyone else paying attention. We’re gearing up for the long haul, and the continued energy and fortitude from our group (especially new leaders) is absolutely inspiring! Join us Weds, March 10 at 2:30 PM PST / 5:30 PM EST for another organizing call and online chat. We will be discussing our Mission and Vision Statements, going over ideas/concepts/coalition members/dates for potential events, and coaching team members on how to use the distribution center to access communications channels. You can check the Key Takeaways post from our last call for an update on where we are at, and we hope to see you on the call/in the chat Wednesday! You are currently browsing the Get FISA Right blog archives for March, 2010.